A US-born journalist has filed a petition with the Inter- American Commission on Human Rights (IACHR) alleging that Mexico is involved with repeated serious violations of OAS human rights treaties. 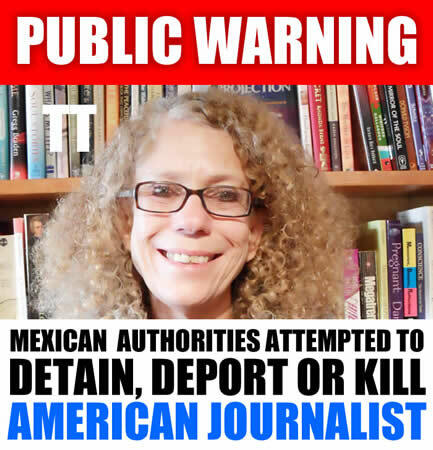 Journalist Janet Phelan claims that Mexican authorities attempted to “detain, deport or kill” her. Along with the petition, Phelan is requesting that protective measures be made available, citing chemical assassination efforts as well as attempts by Mexican officials to falsely frame her arrest. Phelan has been in Mexico since 2010. She fled the US in the wake of events surrounding the cover- up of the murder of her mother, Dr. Amalie Phelan. The petition, filed with the IACHR this past month, provides documentation of specific instances in which Mexican and US government officials refused to provide her required legal protections and also provides medical records supporting the allegations of attempted chemical assassination. Phelan states in the petition that her situation in Mexico became more urgent following the 2014 publication of her book, EXILE, which recounts the circumstances and impetus behind the murder of her mother, and which provides documentation of the involvement of intelligence officers and officials in the US government in the murder/cover-up. Janet Phelan’s articles have appeared in regional and national US publications as well as in international political periodicals. Prior to leaving the US, she also hosted a public affairs talk show on KSKQ in Ashland, Oregon.